The game was ported from Vita on our behalf by Hyde – the same wonderful people who ported Ys SEVEN for us last year. And of course, neither we nor they are the kinds of people to just take a Vita game, slap it on PC, and call it a day; we wanted to make the experience feel like a natural fit on PC, with all the bells and whistles modern PC gamers have come to expect from the very best titles. Additionally, we wanted to ensure it was worth your while to play this version of the game whether or not you’ve played the original version before. The idea of a “quick and dirty” port really isn’t in our lexicon! 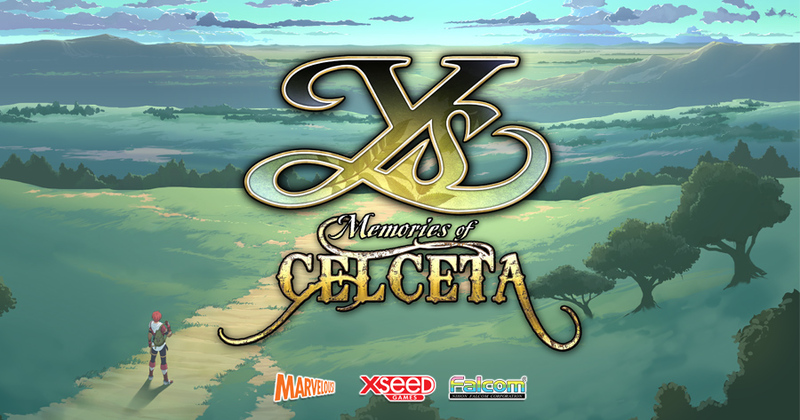 This brings us to the topic of today’s discussion: what’s new in Ys Celceta? Why should you buy this game (WHICH OF COURSE YOU WON’T NEED TO DO SINCE YOU ALREADY HAVE, RIIIIIIGHT? ), and what can you expect when you fire it up for the first time? Those who’ve played the game on Vita experienced it at 30fps, and for a handheld system, that was completely fine. And if you really want to, you can still have that same experience on PC – but you can also play at 60fps, 120fps, or just set the framerate to “unlimited” and let your computer do with the game as it will! Additionally, the game supports resolutions up to and (in certain specific cases) beyond 4k (assuming your video card and monitor support such resolutions, anyway) and offers a bevy of options for smoothing, dynamic lighting, shadows (soooo many shadow options! ), and more. Even at low settings, it looks superb (and runs on a toaster), but at max, it looks positively breathtaking! This one may not sound like much on paper, but it’s actually super-impressive in action: Time Attack and Boss Rush modes are back, and not only did we leaderboard-ize every single possible variation of these modes (separately for Steam and GOG, but worldwide for each), you can also access all stats for them in-game as part of the game’s actual UI – they’ve been fully integrated. And since Time Attack and Boss Rush are accessible during gameplay (after completing the game once), this literally means that at any time, you can pop open the menu, quickly check and see where you stand in the rankings, then dramatically yell “THIS CANNOT STAND!” when you see that you’ve been bested, and challenge yourself again on the spot. Then, when you’re done, you can just resume your trek through the main campaign exactly where you left off, like nothing even happened! So, you remember how our Vita version of the game came bundled in a super-swank LE that included a roughly 130-page art book + strategy guide written in-character as Adol Christin? I sure do – I wrote the damned thing! 😉 Honestly, though, it was one of my proudest moments as a localizer to see the book take shape and become something really special that I could boast having helped bring into existence. So, naturally, when it came time to release Ys Celceta on PC, my very first suggestion was, “ADOL’S TRAVEL JOURNAL PDF INCLUDED TOO PLZ? !” – and amazingly, despite all of their survival instincts telling them to do otherwise, the higher-ups actually listened to me and made it come to pass! So, yeah. Included with your brand-spanking-new copy of Ys Celceta THAT YOU TOTALLY ALREADY BOUGHT, you’ve got Adol’s Travel Journal bundled with it in PDF format. Just open the game folder and look for the Travel_Journal sub-folder, and bam, there it is! Digital, high-res, and free as can be! So please, enjoy! And that’s just some of the cool quality-of-life features we’ve implemented. Fast-forward not fast enough for you during cutscenes? Enable high-speed fast-forwarding in the launcher and… well, suffice it to say, you won’t have any complaints about that anymore. Opposed to ever overwriting a savegame? Not a problem when there are 300 save slots! Save EVERYWHERE! And hey, maybe you don’t like the way the game controls by default? No problem; every single button is re-bindable, allowing for any mixture of controller, keyboard, and/or mouse input you’d like! Whatever your preference is, I think our robust and super-snazzy launcher has got you covered. So if you haven’t played yet, get ready: it’s going to be a wild ride! Or read up on it (and learn a little Ys history in the process) via our newly relaunched World of Ys franchise website at http://www.worldofys.com/celceta.php. See you out in the Sea of Trees, my peeps! PEACE! !